Andy Chu, product manager for Microsoft's mobile communications business, told mocoNews.net: "I was a little shocked when they talked about the messenger (aspect). Yahoo at the moment is not in our developer program, nor is the third party that they mentioned. So we're investigating how that actually happened." Microsoft formally licenses over 70 third parties to use some of its technologies in this way so it can properly guard against things like networks being overwhelmed. Mobile director Jed Stremel said "[oneConnect] sounds very promising. We have not seen the product. I’d be very interested to make sure that they’re using our APIs in a way that respects user privacy, and we’re certainly looking forward to that discussion." Yahoo! stays on Mess.be's radar. Earlier this week the company announced Yahoo! 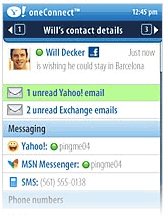 oneConnect, a tool for the mobile phone which conveniently aggregates e-mail, instant messaging (Windows Live Messenger, Yahoo! Messenger, AOL Instant Messenger and Google Talk), text messaging (SMS) and social networks (Bebo, Dopplr, Facebook, Flickr, Friendster, hi5, Last.fm, LinkedIn, MySpace and Twitter). Expect this connectivity nirvana to become available here in the second quarter of 2008. British newspaper The Sun together with fring (see my post earlier this week) are giving away four Nokia N95 8GB phones with fring pre-loaded. You need a free My Sun registration and answer one simple question. More info here. UPDATE: Microsoft scored a GSMA Global Mobile Award in Barcelona in the "Best Mobile Enterprise Product or Service" category for its last year's announced Windows Mobile 6 operating system. I'm not saying their OS is the best I've seen on a mobile device, but -like I frequently mentioned before- it definitely comes with the best mobile Messenger client to date. Whether you love ("amo" in Latin) or hate ("odi") Valentine's Day, we have the right goodies for you to live through February 14th. The Valentine's Day section in CustoMess (look under "Content Generators") gives access to the Love O Matic -a name-based compatibility calculator- and the custom Candy Machine. And don't forget about the Valentine and anti-Valentine packs under "Display Pictures". >> Download CustoMess for Windows Live Messenger. >> Make your emoticons smoochy, create Valentine speech bubbles. (or for Anti-Valentines: Diss & War Emoticons). (or for Anti-Valentines: Violence & War Display Pictures). >> Download the Love Family Pack (30 free animated emoticons). >> Valentine's Day stuff @ Kiwee (please here if you're from the U.S.): Emoticons, Backgrounds, Display Pics and a lot of new Winks. When even the F.B.I. (yes, that's the Federal Bureau of Investigation) is issuing an "Internet Alert", who are we to ignore it? From their press release: "If you unexpectedly receive a Valentine’s Day e-card, be careful. It may not be from a secret admirer, but instead might contain the Storm Worm virus." But do grant us the liberty to generalize the Bureau's warning and state that you should be very wary of any Valentine-related e-mail and instant message containing a hyperlink or file. Cold-hearted virus makers this time of the year love to abuse the occassion to trick you into downloading and spreading their malicious worms via misleading Valentine wishes. So babes and studs, how popular you may even be, don't believe every single declaration of love you'll get. Microsoft at the 2008 Mobile World Congress in Barcelona, announced the new version of its Windows Live Mobile Developer Program. The latest update includes a new SDK which allows developers to create mobile versions of Windows Live Messenger/Mail/Spaces for virtually any mobile phone independent of phone operating system. Consumers, expect the growth mobile Messenger clients to persist! Mobile partners can find extra information here. With the new tools, Microsoft's software vendor partners will be able to build richer clients that access additional Windows Live for mobile capabilities. For example, a developer could make an application that lets a user click to record a voice clip and send it to [a Windows Live] Messenger buddy, even if the sender is using a Windows Mobile phone and the recipient has a Nokia S60 phone. "These are rich and fun and engaging features in Messenger that we had on some of our top-end platforms that are now opened up through this protocol," said Brian Arbogast, vice president of mobile services at Microsoft. In other mobile news, SonyEricsson is releasing its first Windows Mobile device. The Xperia X1, which will probably hit the shops in August 2008, sports a WVGA touch-screen (800x480 pixels) and slide-out QWERTY keyboard. That's just perfect for the Windows Live Messenger for Windows Mobile client. For more specs check the product's homepage, for photos head over to infosyncworld's hands-on. Looking highly desirable if you ask me! There are plenty of free mobile IM clients out there, coming from either IM providers themselves, mobile network operators or third parties. One of them that's been around for a year but lately getting more and more attention is Fring. About 100,000 registered Fring users a month connect to Skype, Windows Live Messenger, ICQ, Google Talk, Twitter, AIM and/or Yahoo!, use it for free local and international calls and, since last week's update, share files (music, pictures, video...) from mobile to mobile or mobile to PC and from fring to fring, or between fring and Windows Live Messenger. Of course, the usual data charges apply when you use it over WiFi or with your mobile data plan. The current client supports Symbian 8 and 9, Windows Mobile 5 and 6 and UIQ operating systems (about 450 current models), and is available in English, French, German, Spanish, Italian, Russian and Chinese. Some of the people behind Fring were part of Mirabilis, the Israeli company that started the whole Instant Messaging hype in the late nineties with their famous ICQ software. Having sold the company in 1998 for $407 million to America Online, these guys know what they're doing. Classify under "one to watch". >> Download Fring v3.30.6 (released February 7th 2008). >> Watch some of fring's demo videos. Not saying I fully agree with the views expressed in this blog post by Chris Battaglia, but it really is an amusing transcription of an imaginary IM conversation with... God. >> Read My conversation with God.